Two Wrongs Make A Right is a collaboration between De Imagerie, Beau Delagaye and Het Bos. Neozoon is a collective based in Germany and France. The artist group has been known for their actions performed in public space in European cities. Founding concept of their work is the relationship between animal and human and the question how modern society deals with both - dead and living animals. Artistic medium of their work is ranging from collages over installations to films. London Bridge is crossed every morning at the same time by thousands of commuters forming a river moving unidirectionally South to North. In this work Teresa Cos presents the mechanical repetition of everyday rituals. Jeroen Jongeleen is a Dutch visual artist often creating work in public space. 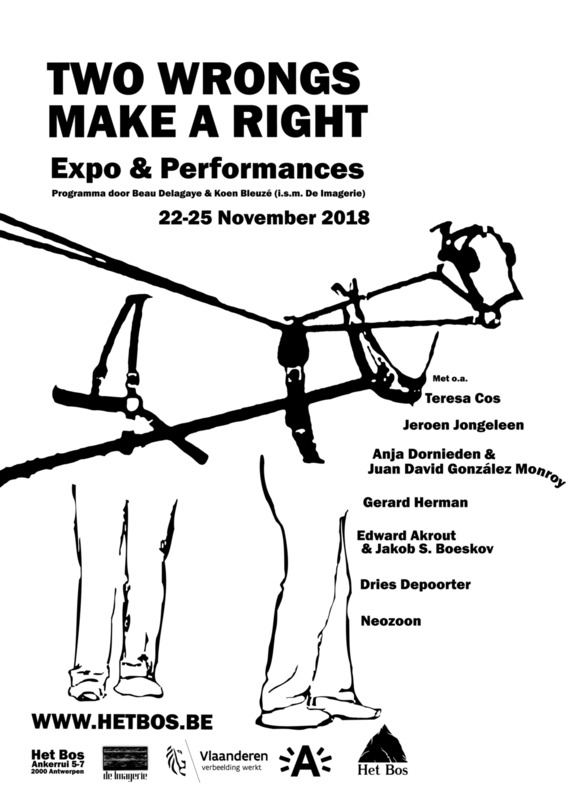 Two Wrongs Make A Right presents one of his video works and a live performance in Park Spoor Noord (24 November 10-17h). In his video Drawing by effort Jongeleen leaves traces in a city park by running repetitive geometrical shapes. ‘Face Detected’ is an installation where several artists are invited to modelling clay portraits, while a computer programme is following their accomplishments through a camera. As soon as the software detects a human face, the artist is notified that the work is finished. In this video, the artists combine pseudoscience with repetition to investigate the connection between technology and truth. Through continuous repetition, the subjects built a relationship with the spoken words, which over time, mature into experiences and finally beliefs. Pilvi Takala’s work sits between a serious investigation and playful agitation of social and political structures. In her complex and rich practice, using disguise to engage and negotiate different social terrains, she reveals unspoken rules within systems of culture. Anja Dornieden and Juan David González Monroy are filmmakers living and working in Berlin. Since 2010 they have been working together under the moniker OJOBOCA. Together they practice Horrorism, a simulated method for inner and outer transformation. Their work encompasses films, performances, installations and workshops. Jeroen Jongeleen’s artwork has been influenced by graffiti, conceptual, textual and land art. His work generally evolves in public space. He leaves traces in the urban landscape which he documents with photographs and films. With his interventions he promotes the free use of urban public space. On Saturday the 24th of November (11-17h), Jongeleen will ‘draw by effort’ through running a repetitive geometric shape in Park Spoor Noord. Gerard Herman is a multidisciplinary artist specialised in graphic art, installations, animation films and sound compositions.